"It's ages since I talked like this to anyone. It's good for me." Eric Rohmer's films are termed comedies, but they won't leave you doubled over with laughter; at best, a winsome smile will cross your face now and again. But when the movie is over, it's likely to stay with you for a while, offering more genuine amusement and intellectual nourishment than those notorious French favorites, tous les films de Jerry Lewis. 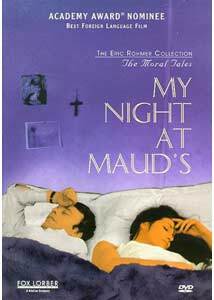 My Night at Maud's is one of his most celebrated and representative pictures, and should serve as a good litmus test for you if you want to get a flavor of Rohmer's work. The setup is awfully simple: Jean-Louis (Jean-Louis Trintignant), an engineer, encounters an old friend, Vidal (Antoine Vitez); Vidal convinces Jean-Louis to join him for Christmas dinner, at the home of his new inamorata. Maud (Françoise Fabian) is divorced, and after her daughter goes to sleep, she and the two gentlemen eat and drink and talk and talk and talk. One of the ongoing debates that Jean-Louis wrestles with is between Pascal and Jansen: do we determine our own destinies, or have the fates decided on them for us already? The actors deserve high praise for their work—in less capable hands, Rohmer's screenplay could sound like a collection of platitudes, but his cast shows off his writing and filmmaking to great advantage. (And that's a good thing, because Rohmer favors long shots, which lend to the realism but don't give actors any place to hide.) The director would probably agree with Vidal's assessment: "I don't like people without problems." And Vidal sets out to make some extra ones for himself—it's a snowy night, and he ducks out for home, leaving Jean-Louis stranded in Maud's apartment, without a spare guest room. Jean-Louis's temptations and loyalties are put very much to the test. One of the things that's disarming about the film is the level of intimacy in the discussions between the characters, especially between Jean-Louis and Maud, who are almost complete strangers. There's a sense from each of them that this is an important encounter, though—as he remarks later, "One day together isn't much, but it's a lot." It's not a movie in which all the questions get answered—life is messy, and Rohmer knows this, so we get just enough to push us through to the end of the story, and no more. But a film with adult people talking about adult things in an adult manner is, these days especially, a revelation, and by the film's conclusion, you sense that Jean-Louis is on the right path, even if he hasn't figured out all of life's secrets. (Have you? If so, please advise.) The influences of this film are obvious, from such likely candidates as My Dinner With Andre to things like Swingers—you may not talk like this or know people who do, but there's much room for empathy with this movie, and Rohmer handles his material with a sure and steady hand. Image Transfer Review: The cinematographic talent on hand for this shoot was extraordinary—the director of photography was Nestor Almendros, who shot many of the late Truffaut films (e.g., Confidentially Yours), Days of Heaven and Sophie's Choice; he was assisted by Philippe Rousselot, who would go on to become a first-tier cinematographer in his own right—his credits include A River Runs Through It and Dangerous Liaisons. All of which makes it that much more disappointing that the film looks so brutalized here—it's full of pock marks and scratches, and the evidence of bacterial decay. There's a certain beauty to black-and-white images ravaged by time, but this film on DVD looks nowhere close to as good as it could or should. Audio Transfer Review: Some hiss and pop can be discerned, and the 2.0 track is limited, but the dynamics are reasonable, and the audio quality is generally at least adequate. Extras Review: Filmographies are provided for Rohmer and Trintignant; there are nine chapter stops listed on the DVD menu, but twenty-eight on the feature itself. A smart and lovely film, My Night at Maud's isn't quite undone by the poor video quality on this DVD—it's too bad that it doesn't look better, but you'll still find much here to savor.